Celebrate with Fair Trade Berkeley at Saul's! 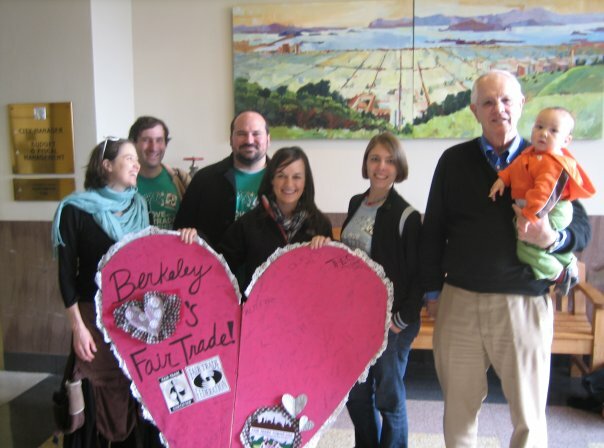 Mayor Tom Bates poses with the Fair Trade Berkeley Steering Committee. On July 13, 2010, Berkeley became the 19th Fair Trade Town in the United States when the City Council passed a Fair Trade resolution, voicing the City’s commitment to Fair Trade. Join Fair Trade Berkeley, Buy Local Berkeley and Berkeley Mayor Tom Bates to commemorate this accomplishment for Berkeley’s first ever Fair Trade happy hour at Saul’s Restaurant & Deli on September 23 from 4-5:30pm. Enjoy appetizers, sample Fair Trade treats from Divine Chocolate, Honest Tea, Numi Tea, La Yapa Quinoa and Thanksgiving Coffee. The happy hour event runs parallel to the Thursday's Farmer's Market, so bring your bags and enjoy the Buy Local, Buy Fair extravaganza! Admission is $15.00 and includes on Fair Trade cocktail by the Fair Trade Spirits Company. Proceeds will help further the educational outreach of Fair Trade Berkeley to grow consumer and retailer awareness regarding the importance of Fair Trade. Berkeley set to become the 19th Fair Trade Town! With many Fair Trade supporters in the crowd, the Berkeley City Council passed a Fair Trade resolution at their July 13th meeting to make Berkeley a Fair Trade town! The Fair Trade Berkeley steering committee members and City Manager’s office have worked very hard over the past year to craft a "Best-in-Class" Fair Trade Town Resolution and City Ordinance. Steering committee member Dagny Tucker, expressed appreciation to Berkeley city officials and citizens for passing the resolution and upholding Berkeley’s history of being a leader in just choices as the resolution works alongside Berkeley’s long list of other important purchasing laws (sweatfree,precautionary principle, etc). An official declaration celebration will be held in August.The mayor and city council are set to attend. Details to come, so keep checking the blog! Berkeley becomes a Fair Trade Town July 13th @ 7pm - Please Attend! Hello, Fair Trade Berkeley Friends and Supporters!!!! I hope this message finds you well amidst fun summer events. I'm writing with Good News!!! Please plan to show your appreciation by attending the Berkeley City Council meeting on Tuesday, July 13th, 7-7:30pm. This will be QUICK this time (hooray!) because the resolution is on the Consents Calendar (the first 15 minutes of the meeting). Essentially, the City Council will "consent" to the resolution barring no objection from the public. Fair Trade Berkeley steering committee dynamo, Dagny Tucker, will be present to offer a less-than-2 minute testimony, expressing our appreciation. By attending, you will visibly represent growers and producers around the world, along with local retailers, faith communities and consumers who understand that Fair Trade choices made locally create world-changing impacts globally. NEXT Tuesday, July 13th, 7-7:30pm. Location: 2134 MLK Jr Way, second floor. We have exciting news! We just received word that the Berkeley City Council will be hearing our resolution to declare Berkeley a Fair Trade City tonight, Tuesday, April 27th at 8pm. The resolution is included as a part of the “Actions Calendar” for tomorrow’s city council meeting, which means that representatives of the Fair Trade Berkeley campaign will be given up to two minutes each to present arguments in favor of the resolution and provide material to address any questions asked by the council. If successful, the item under consideration could result in a vote in support of the resolution, but we will need your help to demonstrate the broad community support for the Fair Trade in Berkeley to ensure that the City Council gets the message. This is a crucial point in the Berkeley campaign as we move one step closer to declaring Berkeley a Fair Trade Town! Join us in showing your support for Fair Trade by attending the meeting in full Fair Trade attire – wear t-shirts with a Fair Trade message on them and bring colorful banners and signs. Then help us turn out the vote by inviting your friends, family and colleagues to do the same. In light of this exciting development, TransFair USA will be opening its community café to the general public between 5-7 pm café for a ‘prep’ rally filled with pizza and sign painting before we head down to the council meeting together. The TransFair USA offices are located at 1500 Broadway @ 15th St. in downtown Oakland. If you can join the ranks – great! But if not, then we hope to see you at the Unified School District Building. Fair Trade Berkeley needs your voice, your signs, and your presence! Come one, come all! If you or another member of your organization are interested or available to speak on behalf of the resolution, please contact Jamie Guzzi, Grassroots Outreach Coordinator, TransFair USA, 510-663-5260 x. 309, jguzzi@transfaiusa.org. and the rest of the Fair Trade Berkeley Team. Last week hundreds of UC Berkeley Students and members of the Berkeley community showed their love for Fair Trade at the Berkeley Fair Trade Fair. The Fair consisted of several booths with chocolate sampling, free T-shirts and general information about Fair Trade Certified. Among the Fair Trade representatives were TransFair USA, Alter Eco, Theo Chocolate, Divine Chocolate and the UC Berkeley Fair Trade Club. While students and passerbys spent time tasting a variety of Fair Trade Certified chocolates and signing petitions to help Berkeley become a Fair Trade Town, others were busy signing one of the largest Valentine's Day cards anyone has ever seen. By signing the card, people were able to show their love and support for Fair Trade in a big way. Not only was the giant heart quite a spectacle on campus, but it now sits in Berkeley's City Hall as a testament to the government's commitment to the Fair Trade Town campaign. The Mayor of Berkeley Tom Bates proudly accepted the card (and a little Fair Trade Certified chocolate), and then posed for a photo-op with the Fair Trade Berkeley team! All in all the day was a great success. The fair was a wonderful way to spread awareness about Fair Trade, to promote Fair Trade certified products, and to gain support for the movement right here in Berkeley. Happy Holidays from TransFair USA! These are a few of my favorite (Fair Trade) things! Learn more about Fair Trade Towns! Friend Us, Follow Us, Watch Us! We are a local coalition of motivated Berkeley community members who want to see our city embrace the mission of the Fair Trade movement.